Doubleday, New York, 180 pages. 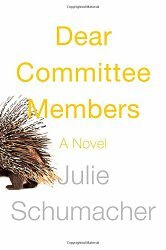 Dear Committee Members is a novel told entirely in the form of Letters of Recommendation written by Jason Fitger, an English professor at a small liberal arts college. That may not sound like a way to write a hilarious novel, but trust me, it is. When my hold on this book came in, I dipped into it – and then had to put it on the top of my to-be-read pile. I finished it the next day, reading it while waiting at a doctor’s office, trying to restrain my laughter. I don’t think I can describe all the delights and sophisticated humor of this book. I will settle for copying out a few example letters. This letter is intended to bolster the application to Wexler Foods of my former student John Leszczynski, who completed the Junior/Senior Creative Writing Workshop three months ago. Mr. Leszczynski received a final grade of B, primarily on the basis of an eleven-page short story about an inebriated man who tumbles into a cave and surfaces from an alcoholic stupor to find that a tentacled monster – a sort of fanged and copiously salivating octopus, if memory serves – is gnawing through the flesh of his lower legs, the monster’s spittle burbling ever closer to the victim’s groin. Though chaotic and improbable even within the fantasy/horror genre, the story was solidly constructed: dialogue consisted primarily of agonized groans and screaming; the chronology was relentlessly clear. Mr. Leszczynski attended class faithfully, arriving on time, and rarely succumbed to the undergraduate impulse to check his cell phone for messages or relentlessly zip and unzip his backpack in the final minutes of class. Whether punctuality and enthusiasm for flesh-eating cephalopods are the main attributes of the ideal Wexler employee I have no idea, but Mr. Leszczynski is an affable young man, reliable in his habits, and reasonably bright. A quick aside, Ted: god knows what enticements were employed during the heat of summer to persuade you – a sociologist! – to accept the position of chair in a department not your own, an academic unit whose reputation for eccentricity and discord has inspired the upper echelon to punish us by withholding favors as if from a six-year-old at a birthday party: No raises or research funds for you, you ungovernable rascals! And no fudge before dinner! Perhaps, as the subject of a sociological study, you will find the problem of our dwindling status intriguing. To the matter at hand: though English has traditionally been a largish department, you will find there are very few viable candidates capable of assuming the mantle of DGS. In fact, if I were a betting man, I’d wager that only 10 percent of the English instruction list will answer your call for nominations. Why? First, because more than a third of our faculty now consists of temporary (adjunct) instructors who creep into the building under cover of darkness to teach their graveyard shifts of freshman comp; they are not eligible to vote or to serve. Second, because the remaining two-thirds of the faculty, bearing the scars of disenfranchisement and long-term abuse, are busy tending to personal grudges like scraps of carrion on which they gnaw in the gloom of their offices. Long story short: your options aren’t pretty…. Ted, in your memo you referred briefly, also, to the need for faculty forbearance during what we were initially told would be the “remodeling” of the second floor for the benefit of our colleagues in the Economics Department. * I’m not sure that you noticed, but the Econ faculty were, in early August, evacuated from the building – as if they’d been notified, sotto voce, of an oncoming plague. Not so the faculty in English. With the exception of a few individuals both fleet of foot and quick-witted enough to claim status as asthmatics, we have been Left Behind, almost biblically, expected to begin our classes and meet with students while bulldozers snarl at the door. Yesterday afternoon during my Multicultural American Literature class, I watched a wrecking ball swinging like a hypnotist’s watch just past the window. While I am relieved to know that the economists – delicate creatures! – have been safely installed in a wing of the new geology building where their physical comfort and aesthetic needs can be addressed, those of us who remain as castaways here in Willard Hall risk not only deafness but mutation: as of next week we have been instructed to keep our windows tightly closed due to “particulate matter” – but my office window (here’s the amusing part, Ted) no longer shuts. One theory here: the deanery is annoyed with our requests for parity and, weary of waiting for us to retire, has decided to kill us. Let the academic year begin! *Under whose aegis was it decided that Economics and English should share a building? Were criteria other than the alphabet considered? Ms. deRueda claims to be sending her transcripts and LSAT scores at the end of the week. God help you – this is your shot across the bow – should you admit her. P.S. : I’ve heard a rumor that Eleanor – yes, that Eleanor, from the Seminar – is a finalist for the directorship at Bentham. You got back in touch with her despite her denouncements of me; do you have any intel? P.P.S. : A correction: you got back in touch with Eleanor because she denounced me. I remember you quoting what she said when I published Transfer of Affection: that I was an egotist prone to repeating his most fatal mistakes. I’ll admit to the egotism – which is undeniable – but I’d like to think that, after fourteen years of marriage, you knew me better than Eleanor did. We were happy for some of those fourteen years, especially before Transfer; why shouldn’t I believe that you were right about me, too? The themes brought up in these letters toward the beginning of the book continue. Yes, we find out more about Janet, Eleanor, and Carole. We hear more about the fiasco of the building remodeling and inequities of funding between departments. We learn about Jay’s history in “the Seminar,” his publishing history, and his attempts to further the fortunes of some particular students. Mostly, this is an inside look at academia, and the result is surprisingly funny and enjoyable. Oh, and it’s also fun that the person writing the letters is articulate and insightful. An example of a highly intelligent person who sees the foibles around him and can poke fun with razor-sharp precision. This entry was posted on Wednesday, February 18th, 2015 at 10:42 pm and is filed under Contemporary, Fiction Review, Humorous, Starred Review. You can follow any responses to this entry through the RSS 2.0 feed. You can leave a response, or trackback from your own site.